The portrait of Fr Laurence, an Ampleforth monk, has caught his sensitive, gentle, yet playful character; perhaps also his simplicity of heart. As a boy, he had been adept at swarming up trees. The old agility came to the fore when he was supervising the building of the church at Stanbrook Abbey, Worcester. Climbing fearlessly past the scaffolding and up the turret, he set a cross at the tower's summit. Father Laurence completes the trio of holy men who have played an important role in the community's history to date. Appointed vicar, or chaplain, in 1863, he found at Stanbrook a desire to restore the full monastic observance that had been rudely shattered when the nuns were expelled from Cambrai in 1793. But the clock could not be turned back seventy years. Instead, he passed on with enthusiasm what he had received first hand from Dom Prosper Gueranger, abbot of Solesmes: an understanding that the public choral celebration of Mass and the Office is not only of prime importance in the monastic day as an act of divine worship, but also central to the individual's spiritual growth. 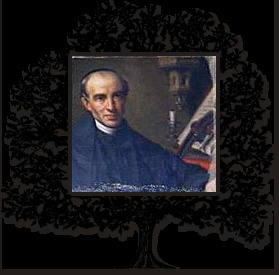 He provided the means to implement this vision: a grounding in Latin and a fine patristic library, together with a church where the liturgy could be celebrated with beauty and solemnity. With the support of Abbess Gertrude d'Aurillac Dubois, Abbess from 1872-1897, a printing press was set up in 1876 and the new monastery buildings erected. When Father Laurence died, he left a community flourishing in number and vitality. He is buried in the church that is his monument. We can trust that his prayers will continue to help the Stanbrook community to develop its physical and spiritual patrimony into the twenty-first century. Copyright © 2019 Stanbrook Abbey. All Rights Reserved.